It doesn't happen very often, but you've been invited to participate in the making of a game without having to actually contend with a lot of complicated coding. Pinqu! 's new space-based arcade exploration game MòOóN has you stranded in caverns on the moon trying to retrieve components to reassemble your craft and fending off some bizarre native lifeforms with a plethora of different offensive weaponry, each with its own unique physics. It's definitely developed enough to be an exciting if basic action shooter, but Pinqu! 's also seeking ideas from the player community about what would make it even better. If you've got a great idea for something to add to MòOóN, leave a comment about it below! MòOóN is one of those action games where you use the [WASD] keys (or [arrows] if preferred) to navigate while you use the mouse to aim. 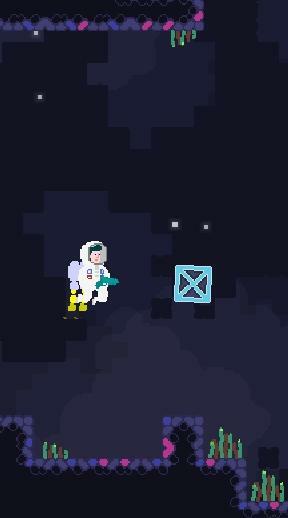 Search the moon caverns for component parts and new weapons while avoiding the beasties. (New weapons crates, shown at right, have to be shot open and then use [E] to retrieve them.) The left mouse button shoots, while the right activates a personal shield device for as long as it's held down. Both of those use up some energy — some weapons use up a lot more energy than others, usually based on damage — but getting zapped by the aliens depletes your oxygen supply (likely caused by damage to your suit) and you need oxygen to live, so using up energy is preferable as it replenishes. Finishing off a critter may or may not leave behind oxygen or energy molecules (wait, energy molecules?) to keep you alive, so the clock is ticking! The compass display at the bottom-right will indicate where the exits are for an area, and [M] pulls up a handy map which shows where you are, how rooms conjoin, and which visible rooms contained parts. We found game balance to be in need of a little reworking; as of this review oxygen runs out quickly enough to make the difficulty level insurmountable with over twenty parts for your craft to retrieve. We also found that trying the different types of offensive hardware and sticking to our favorite worked better than swapping out for whatever happened to come along. Also, that the machine gun offers a pretty nice balance of power consumption, damage and recharge time while the grenade launcher consumed too much energy and also risked some unsafe ricochets upon missing. Whatever MòOóN becomes — and that's up to you the players and Pinqu! — we can't wait to see what it is! Faster power refills, more drops, less bouncy walls, stronger jetpack, longer health bar, smaller/better portals, autopickup for drops, (slow) autofire for pistol, invulnerability periods, health bars on enemies, shorter game. Of course, the game would be better with more variety on various things: more enemies, more guns, more pickups, more players (player characters), more keybindings, or even more options. Also noticeably lacking is a tutorial or help system: controls are listed on the game page, but beginners might forget those easily. Whether the game gets easier or bigger, I have confidence that the game can get much more engaging as things are tweaked and added. The amount of features added up to Proto6 is amazing. It's still a high-difficulty game where getting careless anytime is fatal, but you do get a huge set of weapons to blast everything in your path. Proto7 takes most of that away and makes you earn it. I've only seen a total of four weapons in an hour of playing it, partly because I can't survive long enough to reach new areas. Some advice for players: use the right-click shield to run through bullets, letting you get around faster... but watch your back for sneak attacks.